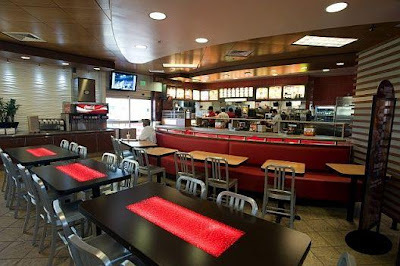 Weighty Matters: Feng Shui at McDonald's? "The restaurant combines elements of water located on the exterior of the dining area, symbolizing life and relaxation, with elements of fire and red accents throughout the dining area to symbolize good luck, laughter and light. The dining area also features symmetrically balanced seating arrangements in earth tone shades, pendant lights to warm up the interior, an elevated PlayPlace and three plasma televisions." Because nothing says Feng Shui like plasma screen televisions? "We chose a Feng Shui design that creates a soothing environment for our customers to better enjoy their dining experience"
Wouldn't even the weakest definition of "dining" include cutlery?